Endre Farkas was born in Hungary and is the child of Holocaust survivors. The family escaped the Communist repressions in 1956 and settled in Montreal. Endre has published eleven books of poetry and plays, and his works have been translated into French, Spanish, Italian, Slovenian, Turkish and Hungarian. He has read and performed widely in Canada, the United States, Latin America, and Europe and has collaborated with musicians, actors, dancers and other poets to create interdisciplinary pieces that have been performed live and on radio across Canada and Europe. Endre's videopoem Blood is Blood, co written/produced with Carolyn Marie Souaid, won first prize at the Berlin International Poetry Film Festival in 2012. Endre's first novel is called "Never, Again." Set in post-war Communist Hungary, in the fictional town of Béke, Never, Again is the story of seven-year-old Tomi Wolf, the son of Holocaust survivors who have never told him anything about their past experiences in the concentration camps of World War II. When the story opens, in the fall of 1956, the boy is about to start school. Never, Again is Tomi’s journey— physically, emotionally and symbolically from innocence to experience, to understanding and freedom. The story chronicles his experiences in the months leading up to the 1956 Hungarian uprising and his loss of innocence during that time. Although most of the narrative is told from his perspective in his attempt to understand the events unfolding around him, there are, interwoven into the escape story, flashbacks of his parents’ World War II experiences—stories of labour and concentration camps, of survival and escape. 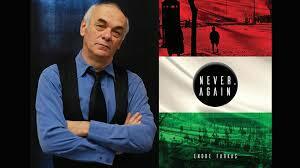 Never, Again is loosely based on Endre’s own experiences during this tumultuous time. By no means a black and white story, Never, Again is an adventure that takes place on a number of levels. It is about the complexities of being a child during turbulent times. It is about faith, prejudice, ignorance, hate and nationalism, as well as kindness, loyalty, hope and courage. The title Never, Again was chosen because this phrase has universal resonance. Originally, it was a response to what was done to the Jews in World War II. It has since then become a universal declaration to not allow this to happen to any other ethnic, cultural, religious, political group of people. “Never again” is civilization’s response against our barbarous nature. It reminds us that we have to be ever vigilant because, as we continue to see, these kinds of horrors can and do happen over and over again. It is why the comma was inserted between “Never” and “Again.” The title is both a call for vigilance and a warning. At this "TBDJ Meet the Author" event, Endre reads from excerpts of "Never, Again," answers questions from the audience, and personally signs copies of the work which will be available for sale.